AZAMIAN, M. , KABIR, E. , SEYEDIN, S. , MASEHIAN, E.
In this paper, a sparse method is proposed to synthesize the note-specific atoms for musical notes of different instruments, and is applied to separate the sounds of two instruments coexisting in a monaural mixture. The main idea is to explore the inherent time structures of the musical notes by a novel adaptive method. These structures are used to synthesize some time-domain functions called note-specific atoms. The note-specific atoms of different instruments are integrated in a global dictionary. In this dictionary, there is only one note-specific atom for each note of any instrument, resulting in a sparse space for each instrument. The signal separation is done by mapping the mixture signal to the global dictionary. The signal related to each instrument is estimated by a summation of the mapped note-specific atoms tagged for that instrument. Experimental results demonstrate that the proposed method improves the quality of signal separation compared to a recently proposed method. A. Liutkus, J. L. Durrieu, L. Daudet, and G. Richard, "An overview of informed audio source separation," WIAMIS 2013, Paris, pp. 14, 2013. H. B. Barlow, Possible Principles Underlying the Transformations of Sensory Messages, W. A. Rosenblith, Ed. The MIT Press, 2012, pp. 216234. N. Cho, C. C. J. Kuo, "Sparse representation of musical signals using source-specific dictionaries," IEEE Signal Processing Letters, vol. 17, no. 11, pp. 913-916, Nov. 2010. R. Gribonval, M. Nielsen, "Sparse representations in unions of bases," IEEE Transactions on Information Theory, vol. 49, no. 12, pp. 33203325, Dec. 2003. E. J. Candes, L. Demanet, "The curvelet representation of wave propagators is optimally sparse," Communications on Pure and Applied Mathematics, vol. 58, no. 11, pp. 14721528, Nov. 2005. 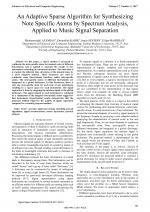 M. Yaghoobi, T. Blumensath, M. E. Davies, "Dictionary learning for sparse approximations with the majorization method," IEEE Transactions on Signal Processing, vol. 57, no. 6, pp. 21782191, Jun. 2009. M. Aharon, M. Elad, A. Bruckstein, "rmK-SVD: An algorithm for designing overcomplete dictionaries for sparse representation," IEEE Transactions on Signal Processing, vol. 54, no. 11, pp. 43114322, Nov. 2006. H. Huang, J. Yu, W. Sun, "Super-resolution mapping via multi-dictionary based sparse representation," Int. Conf. on Acoustics Speech and Signal Processing, IEEE, Florence, 2014, pp. 3523-3527. Y. Xu, G. Bao, X. Xu, Z.Ye, "Single-channel speech separation using sequential discriminative dictionary learning," Signal Processing, vol. 106, pp. 134140, Jan. 2015. M. Yaghoobi, L. Daudet, M. E. Davies, "Parametric dictionary design for sparse coding," IEEE Trans. Signal Processing, vol. 57, no. 12, pp. 48004810, Dec. 2009. M. Zibulevsky, B. A. Pearlmutter, "Blind source separation by sparse decomposition in a signal dictionary," Neural Computation, vol. 13, no. 4, pp. 863882, Apr. 2001. M. M. Goodwin, M. Vetterli, "Matching pursuit and atomic signal models based on recursive filter banks," IEEE Transactions on Signal Processing, vol. 47, no. 7, pp. 18901902, Jul. 1999. S. G. Mallat, Z. Zhang, "Matching pursuit with time-frequency dictionaries," IEEE Transactions on Signal Processing, vol. 41, no. 12, pp. 33973415, Dec. 1993. J. A. Tropp, "Greed is good: Algorithmic results for sparse approximation," IEEE Transactions on Information Theory, vol. 50, no. 10, pp. 22312242, Oct. 2004. T. Virtanen, "Monaural sound source separation by nonnegative matrix factorization with temporal continuity and sparse criteria," IEEE Trans. Audio Speech Lang. Process., vol. 15, no. 3, pp. 10661074, Mar. 2007. D. FitzGerald, Automatic drum transcription and source separation, Ph.D. dissertation, Dublin Inst. Technol., Dublin, Ireland, pp. 11-62, 2004. G. J. Jang, T. W. Lee, Y. H. Oh, "Single-channel signal separation using time-domain basis functions," IEEE Signal Processing Letters, vol. 10, no.6, pp. 168-171, Jun. 2003. K. Ellis, E. Coviello, A. B. Chan, and G. Lanckriet, "A Bag of Systems Representation for Music Auto-Tagging," IEEE Transactions on Audio, Speech, and Language Processing, vol. 21, no. 12, pp. 25542569, Dec. 2013. Y. Vaizman, B. McFee, G. Lanckriet, "Codebook-based audio feature representation for music information retrieval," IEEE/ACM Transactions on Audio, Speech, and Language Processing, vol. 22, no. 10, pp. 1483-1493, 2014. N. Cho, Y. Shiu, C.-C. J. Kuo, "Audio Source Separation with Matching Pursuit and Content-Adaptive Dictionaries (MP-CAD)," 2007, pp. 287290. N. Cho, Yu Shiu, and C.-C. J. Kuo, "Efficient music representation with content adaptive dictionaries," 2008, pp. 32543257. P. Leveau, E. Vincent, G. Richard, and L. Daudet, "Instrument-Specific Harmonic Atoms for Mid-Level Music Representation," IEEE Transactions on Audio, Speech, and Language Processing, vol. 16, no. 1, pp. 116128, Jan. 2008. B. L. Sturm, C. Roads, A. McLeran, J. J. Shynk, "Analysis, visualization, and transformation of audio signals using dictionary-based methods," Journal of New Music Research, vol. 38, no. 4, pp. 325341, Dec. 2009. B. S. Kirei, M. D. Topa, I. Muresan, I. Homana, N. Toma, "Blind source separation for convolutive mixtures with neural networks," Advances in Electrical and Computer Engineering, vol. 11, no. 1, pp. 6368, 2011. Z. Koldovsky, P. Tichavsky, "Time-domain blind separation of audio sources on the basis of a complete ICA decomposition of an observation space," IEEE Transactions on Audio, Speech, and Language Processing, vol. 19, no. 2, pp. 406416, Feb. 2011. G. J. Jang and T. W. Lee, "A probabilistic approach to single channel blind signal separation," in Advances in Neural Information Processing Systems, Vancouver, BC, Canada, Dec. 2002, pp. 11781180. N. Cho, C. C. J. Kuo, "Sparse music representation with source-specific dictionaries and its application to signal separation," IEEE Transactions on Audio Speech Lang. Process., vol. 19, no. 2, pp. 337-348, Feb. 2011. E. Vincent, S .Araki, P. Bofill, "The 2008 signal separation evaluation campaign: community-based approach to large-scale evaluation," in Independent Component Analysis and Signal Separation, vol. 5441, Springer Berlin Heidelberg, 2009, pp. 734-741. M. Goto, H. Hashiguchi, T. Nishimura, R. Oka, "RWC music database: musical instrument sound database," ISMIR, 2003, pp. 229-230. Citations for references updated on 2019-04-22 04:00 in 175 seconds. Website conception, design and maintenance by Eugen COCA. Content updated on 28 Feb 2019. Site engine updated on 28 Feb 2019. This page was generated on the server in 0.091 seconds and loaded in your browser in > seconds.